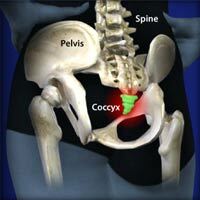 Coccydynia is a disabling problem which is manifested by rather severe and chronic tailbone pain. A coccygectomy is performed to treat coccyx or tail bone pain. We are one of the leading centers in the United States performing this procedure successfully . Often when the tail bone or coccyx is broken or damaged it never completely heals. Since the body does not actually need the coccyx, a coccygectomy is performed to remove it. This procedure is designed to permanently correct your problem and reduce or eliminate your pain.Our success rate is over 95%. If you are certain that a coccygectomy is the right treatment for you based on a referral from a doctor or recommendation from another surgeon, the highly skilled surgeons at Advanced Orthopedics are a great choice for getting this procedure done. As a part of Advanced Orthopedics' commitment to our patients, we have put together a quick and easy to use tool to help determine whether a coccygectomy is the right treatment for you.